Information technology is undergoing rapid change as organizations of all types begin to embrace the idea of moving computing infrastructure from on-premises to the cloud. The 2014 State of the CIO survey from CIO magazine shows cloud and mobility are the top items on IT leaders’ radar screens (see Figure 1). 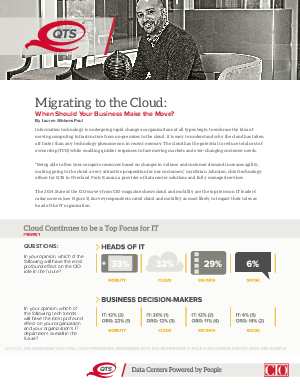 Survey respondents rated cloud and mobility as most likely to impact their roles as head of the IT organization. What is it about the cloud that you don't understand? When do you think your business should migrate?